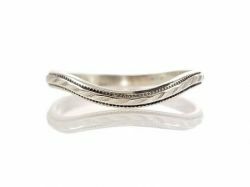 Antique, Art Deco & vintage style curved wedding bands and ring guards that make the perfect compliment for reproduction filigree ring mountings or antique filigree engagement rings. 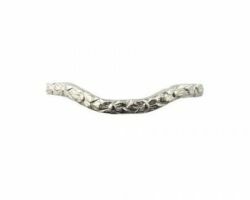 These bands are made to order in sterling silver, 14k yellow, white or rose, 18k yellow or white or platinum. We will manufacture a band according to your selected specifications. Email for a quote on customizations. If your purchasing the ring as a gift or your not positive of the size it's best to wait and size your ring locally. Curved wedding bands are sold individually but also can be paired to wear as ring guards. Curved bands (that do not contain stones) narrower than 3.5mm are able to be adjusted for a close fit to your ring regardless of the shape of the curve shown in the sample images. To fit a curved bad to match the contour of one of our rings we need to know the item # so we can use that as a guide. For engagement rings purchased elsewhere or that are an heirloom there are two options; a local jeweler can do the fitting and the sizing as that can't be done until all fitting is completed or use a 2 part mold kit, that can be purchased at most local craft stores or online, to make an impression of the side contours and top shape of your ring for us to custom fit. Inquire for us to email instructions on how to properly make a mold. 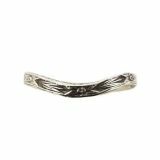 2.1mm wide curved wedding band with a continuous embossed flower blossom design. Made to order from a mold of an antique ring. 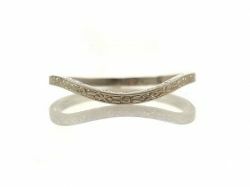 2.5mm wide notched wedding band with a vintage embossed design for Tiffany style solitaire rings. Cast per order and available in 14k yellow, 14k white, 14k rose gold or platinum. Vintage style 2.0mm wide squared curve band with .12cttw of pave' set diamonds and millgrain detailing. 2.75mm wide curved wedding band with a Victorian forget me not flower design. Cast per order using molds of actual antique rings or original hand carved dies. 2.75mm wide curved wedding band with a Victorian forget me not flower design. Made to order using molds from original hand carved dies and available in 14k, 18k & platinum. 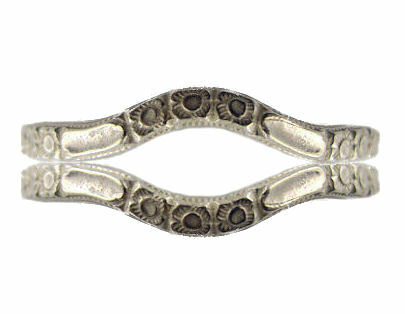 A floral and foliate 2.4mm wide curved wedding band. Cast to order using a mold of the original antique hand carved die. 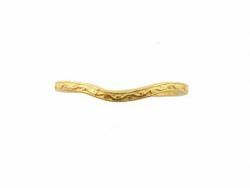 A floral and foliate 2.4mm wide curved wedding band. Cast to order using a mold of the original antique hand carved die and available in 14k, 18k & platinum. 2.2mm wide curved wedding band with a vintage orange blossom design. Cast to order using a mold of the original antique dies.